Nov 13, 2002 – Oskar Blues Brewery ships a new beer this week in a container unique for a Rocky Mountain craft brewery. 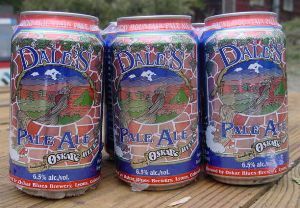 Dale’s Pale Ale, a substantial beer at 6.5% alcohol by volume, will be sold along Colorado’s front range in aluminum cans. Specialty brewers in other parts of the United States and around the world already sell specialty beers in cans, but Oskar Blues — located in the small town of Lyons — is the first from Colorado. We like pushing the envelope and stretching the boundaries,” said Dale Katechis, founder of Oskar Blues. “We like hearing something can’t or shouldn’t be done and then doing it. That’s what craft brewing is supposed to be about. Why put such a big beer into a little can? “The public’s perception,” Katechis said, “is that cans are a cheap way to sell cheap beer. But we see cans as the beer industry’s most popular package and the premium way to present our beer to the public. Unlike bottles, cans eliminate the risk of light damage and oxidation to our beer.” The glass polymer lining of Dale’s Pale Ale cans also ensures the beer never contacts metal. “The canned market offers nothing for the beer connoisseur,” said Brian Lutz, head brewer at Oskar Blues and Redfish New Orleans Brewhouse in Boulder. “There’s a void there that needs to be filled, craft beer lovers deserve a choice in beer packaging.” In addition to providing the most protective package for his beer, Lutz said. Cans are far more environmentally friendly than bottles, they’re much easier to recycle. They also make it easier for outdoor enthusiasts to take great beer into the backcountry, in the canoe, the ski-pack, anywhere they want to go. Dale’s is packaged using canning gear from Cask Brewing Systems in Canada. Oskar Blues has installed the system in a once abandoned barn adjacent to the company’s brewpub/blues bar in Lyons. See the original article here: http://www.realbeer.com/news/articles/news-001790.php.